ANTENNA★POP | indie music for the soul. That’s right! As the title suggests, Aira Mitsuki and Saori@destiny are coming back with a brand new collaboration album! The album is titled “X~PARK OF THE SAFARI” and is set for release on December 7th! For those of you that are unfamiliar with Aira Mitsuki and Saori@destiny, they are both electronic artists produced by Terukado under the label D-topia Entertainment. 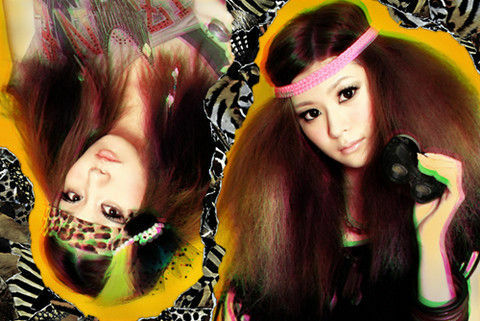 The girls debuted back in 2007 and since then have been favorites of the underground electro scene in Tokyo. Just look at the new promotional image shown above, don’t they look fabulous? Check out the cover and album info including the tracklist below under the cut! Why, hello everyone! I’m back! I feel so guilty for abandoning this blog. But as some of you know, I moved from Puerto Rico to Philadelphia to start university. College life has taken a lot of my time, and in my spare time I end up doing other things. But I decided to keep this place alive. Even if it’s just a little bit. Again, my apologies to my loyal readers who were looking forward to new posts. Please look forward to new posts! Antenna Pop is here to stay! Our favorite electropop newcomer MAA will release her 3rd single (also her first non-rental exclusive single) on July 20th! The single is titled “OKay“, a midtempo electropop track which features MAA’s strong vocals. The single will include two b-sides; “F.B” and a remix of “Tomorrow @ Your Kingdom” by THE LOWBROWS for a total of three tracks. Check out a 30 second preview of the music video below! You can also check out the full artwork for the single here. Antenna Pop is still alive! First of all, I’d like to apologize for the inactivity. There hasn’t been a post for nearly three months now. It’s not that I’ve lost interest, it’s just that I’ve got a lot on my plate recently. Since I’m moving overseas for university, I can’t find time to work with the blog. However, I still want this blog project to go on! Better having occasional posts than nothing at all, right? Indie pop starlet Nanba Shiho caught our eye only a few months ago with the release of her charming debut single “Aurora ni Kakurete.” Now, her audience is about to get even bigger! 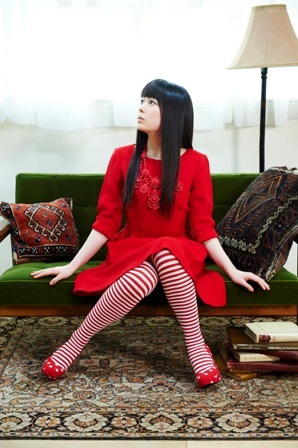 Her latest single “Kodona no Kaidan” is the collaborative effort of Sakanaction‘s Yamaguchi Ichiro and Base Ball Bear‘s Koide Yusuke and will be sold exclusively to Tower Records stores as of June 15th (the song has already premiered on Tokyo FM’s SCHOOL OF LOCK! and you can get your first listen at the 7:56 mark in this video here). The timing, a day after her 18th birthday, is no coincidence: “kodona” is a combination of the Japanese words kodomo (child) and otona (adult). Composer Yamaguchi said of Nanba, “Though she isn’t simple-minded, she has a strong sense of childlike purity about her, but I also thought her to be someone with the frank and honest eyes of an adult. I was left very interested in the kind of adult she’ll grow up to be.” On his approach to the song’s composition, he spoke of his desire to create something that didn’t fall in line with the trends of today, but even so, could only be sung in the present. Similarly, Koide — who described Nanba as “unlike anything in the music scene these days” — chose to explore the moment in time between childhood and adulthood in the song’s lyrics. To ensure that Nanba reaches fresh ears far and wide, not one, but two tie-in campaigns for the single have been secured! For many years, Pocky and music channel SPACE SHOWER TV have worked to put the spotlight on up-and-coming artists in their collaborative CMs, and Nanba can now count herself amongst them. Both the CM and her single’s upcoming PV were supervised by award-winning Perfume art director Seki Kazuaki; you can see the many sides of Nanba on Pocky’s site here. In another great opportunity, “Kodona no Kaidan” is also set to serve as the theme song to the 2011 Parco Swim Dress campaign. Aimed towards the summer swimsuit season, the CM is planned to be shown both on TV and in Parco buildings across the country. We look forward to what the future has in store for this highly underrated singer! Antenna Pop welcomes our new writer, Cait! So Antenna Pop readers might know that this blog is run by one person. In other words, me. As I feel that one writer is not enough for this wonderful blog, I decided to add one more writer. Now officially making Antenna Pop a team! I’m also considering adding more writers in the future, but for now it’ll be the two of us. Our new writer is Cait! She’s a very dear friend of mine, and she also runs her own blog titled “Stars in the blue sky*“, make sure to check it out! She’s also one of the writers in JPopAsia, which is very impressive from my point of view. One of the reasons why I decided to do this, is because I feel like I rarely update Antenna Pop. Making very little posts. However, now with Cait joining me, there will be more variety and more frequent posts. So make sure to check us out more often! I also have opened a “Suggestions” page, where you can comment and suggest a favorite indie act of your own to be featured in our blog. Of course, not all suggestions will be taken, but if we feel like your suggestion is indeed interesting to talk about, then we’ll post about it! The suggestions do not limit just by artists, but by topics as well. There is many possibilities, so don’t be afraid to suggest something! That’ll be all for now, make sure to support and look forward to Cait’s posts!